I've always loved Good Eats and the scientific approach to cooking and baking that Alton Brown takes. When Good Eats: Reloaded aired, I really appreciated his willingness to admit that he made some mistakes on his original show, and his desire to share the new techniques that he's learned over the years. And that's true for all cooks and bakers - we should always be learning and trying new things, and finding a better way to do something now doesn't negate everything we've done in the past or make us less credible. It just makes us human. 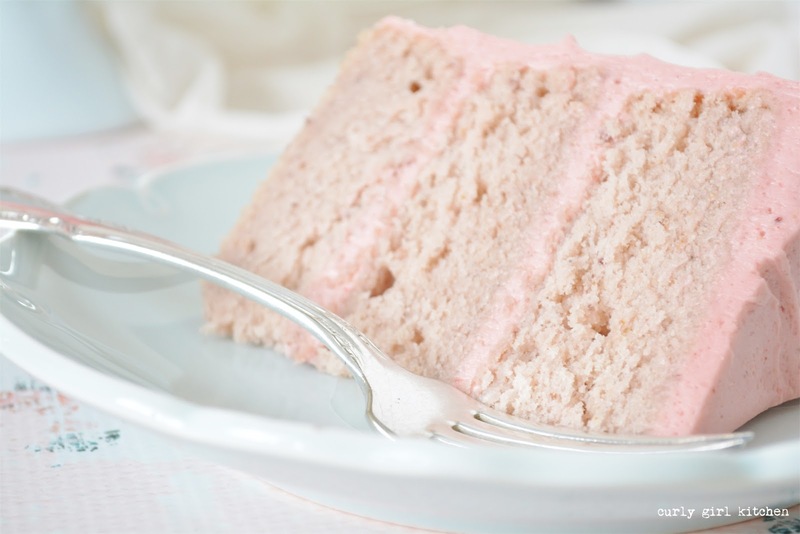 So with that in mind, I've been re-testing my Strawberry Cake recipe. The one I made last summer for my 40th birthday was the first time I'd tried using freeze-dried strawberries in a cake, and I really loved the result. 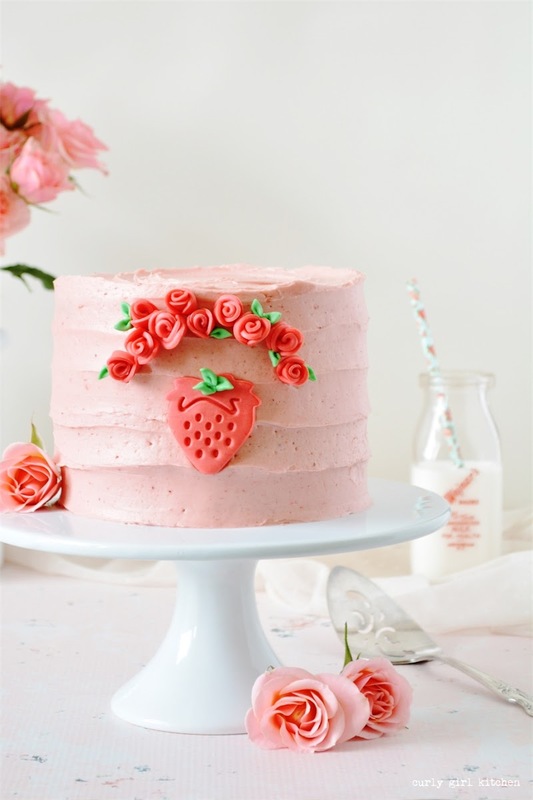 The freeze-dried strawberries, crushed into powder, turn into a strawberry flour which is mixed in with the dry ingredients, and it gives the cake an extra boost of flavor that you can't get with just fresh strawberries. But I wanted to try it again, with a few more changes. 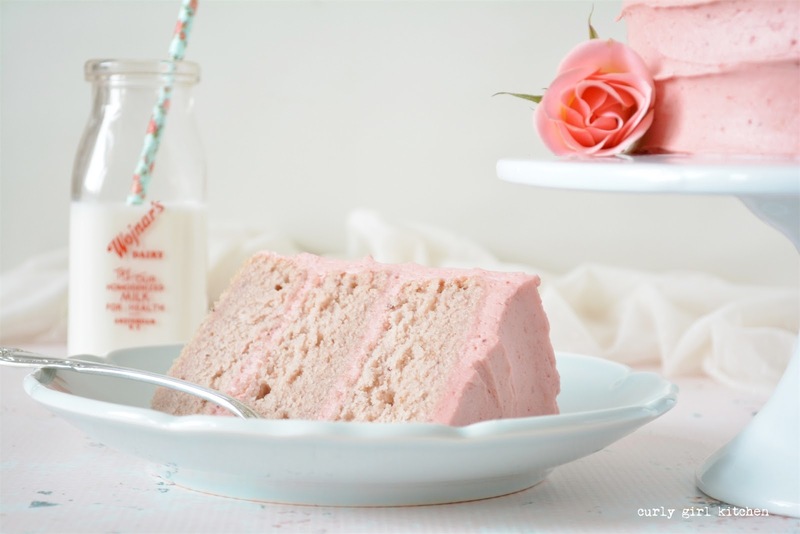 This time, I used fresh strawberry puree in addition to the strawberry powder for even more flavor. 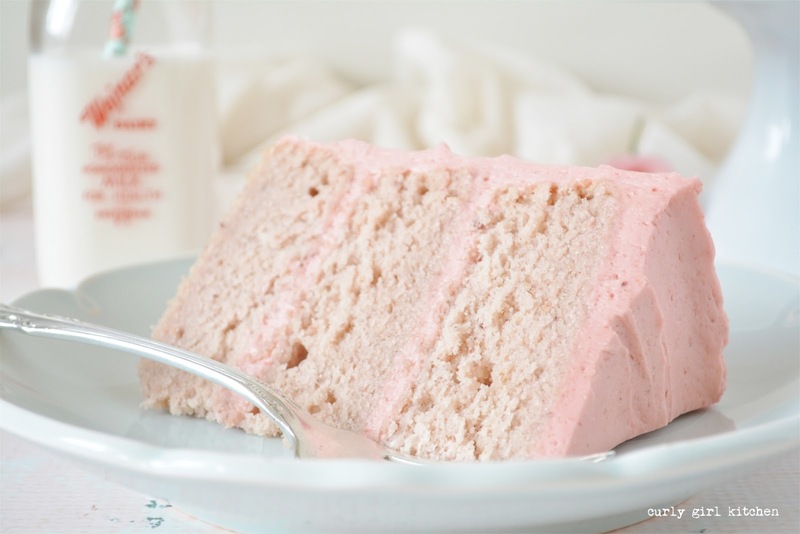 I used all egg whites to see if that would help preserve the pink color of the cake, and I swapped in buttermilk for the whole milk and sour cream. I've recently fallen in love with buttermilk all over again, and have been putting it in everything. 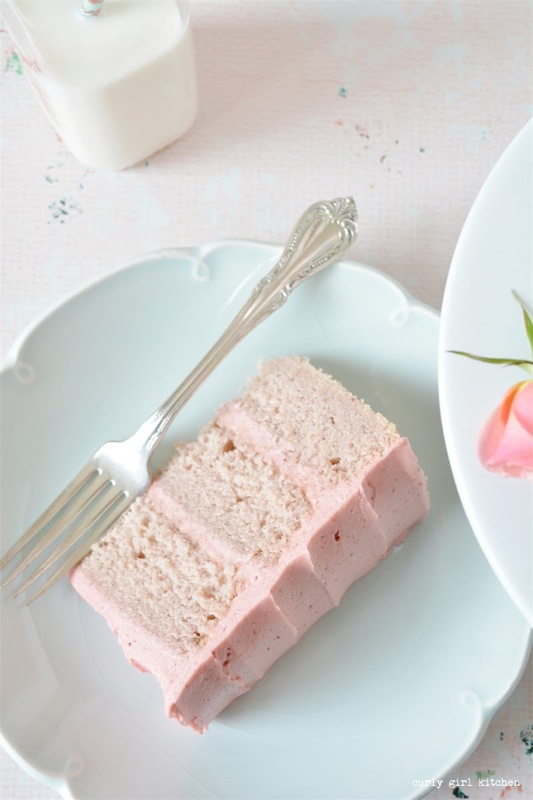 If you're looking for a completely from-scratch strawberry cake that has loads of strawberry flavor, then I think you'll really love this cake. 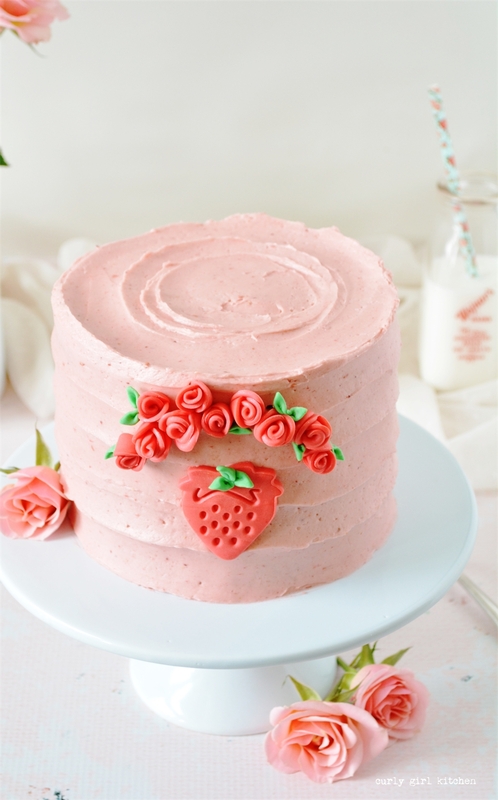 It was very moist and tender, and the flavor of the strawberries really came through in both the cake and the buttercream. 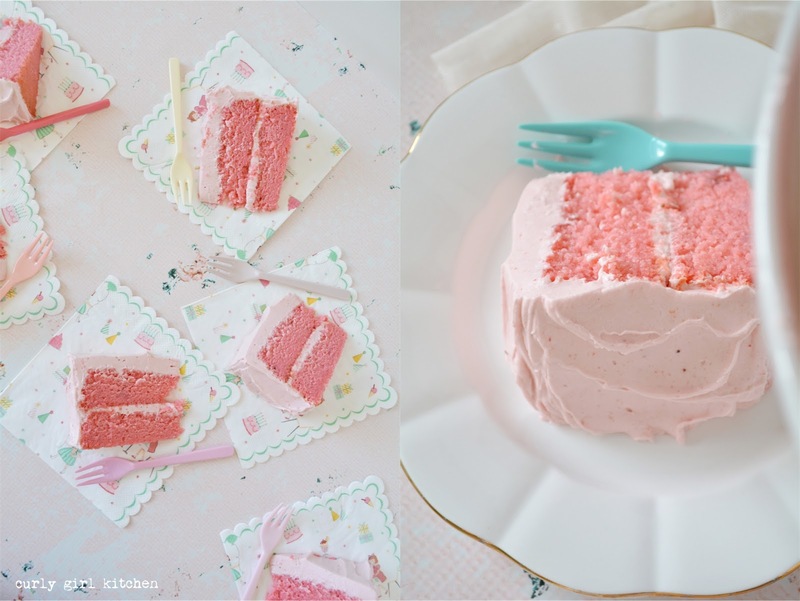 What you won't get, though, is a strong pink color in the cake. 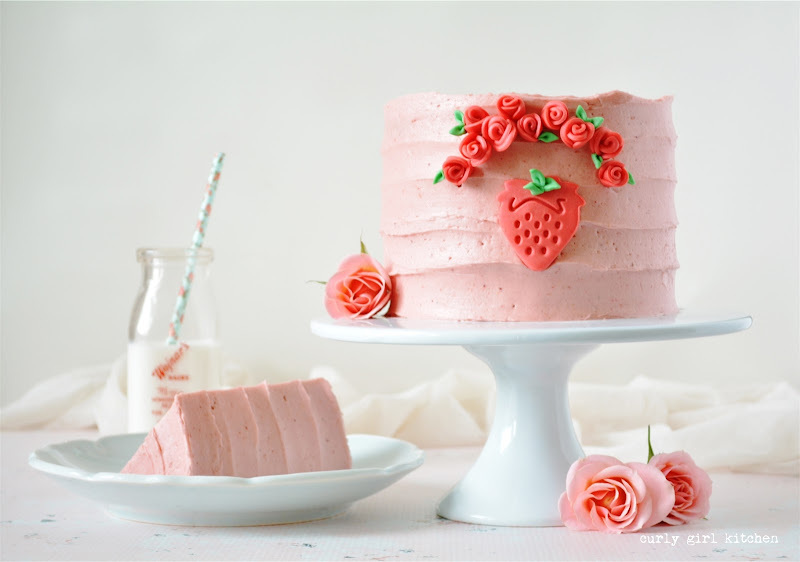 Strawberries fade to a light pinkish-tan color when baking, and years of trying different techniques to preserve their color has not changed this fact. 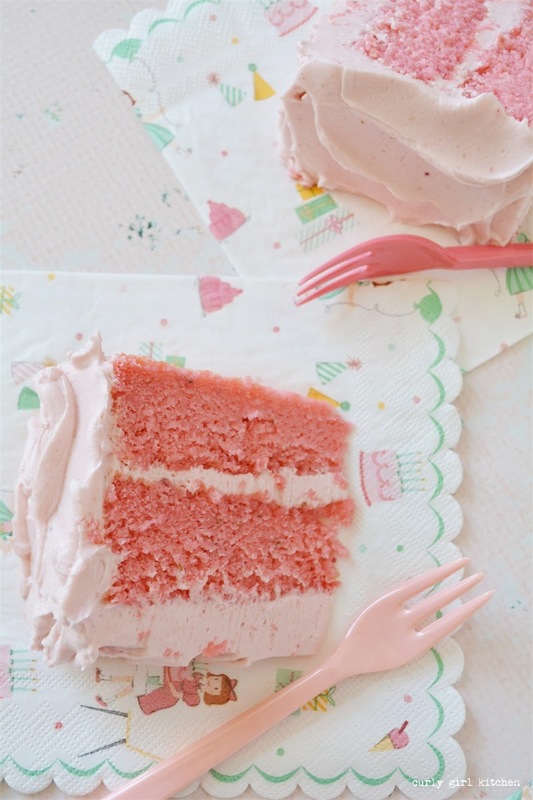 If the color of the cake is important to you, just add a little red or pink food coloring to the batter for a vivid pink color in the baked cake. The only con to using the freeze-dried strawberry powder is the expense. It's a costly ingredient, ranging from about $2.40 per ounce on the low end, to over $4.00 per ounce. I've bought mine on Amazon, but I believe it's also available at Trader Joe's. 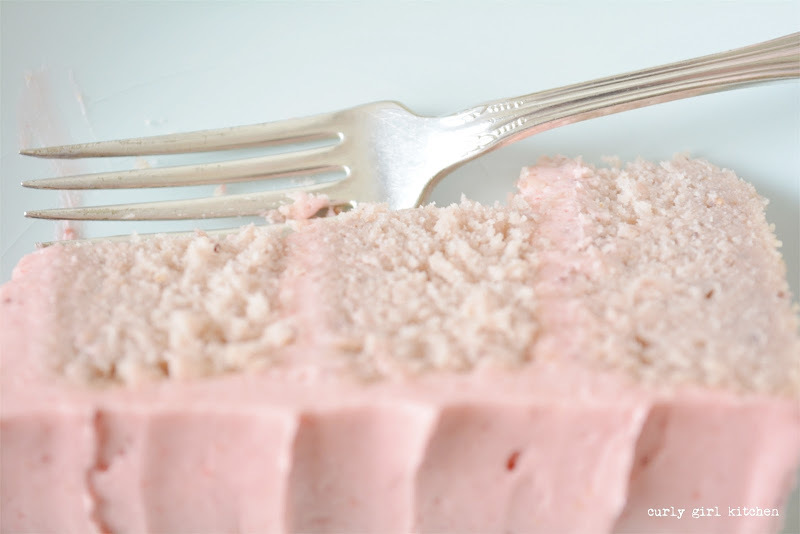 Because of the expense, I experimented with the use of strawberry jello/gelatin in the cake batter - scroll to the end of this post past the recipe to read my thoughts on this. One of my favorite toys when I was a kid was my strawberry shortcake doll. She smelled so good, and her little outfit was just the cutest thing ever. I had my doll in mind when I was decorating this cake with pretty little fondant accents. The strawberry cutter is a plunger-style cutter also used for pie crust cutouts, and I believe I found it on Etsy a while back. For the tiny roses, I used an inexpensive little rose cutter from Craftsy, but they've recently changed ownership, and I can no longer find it on their website. 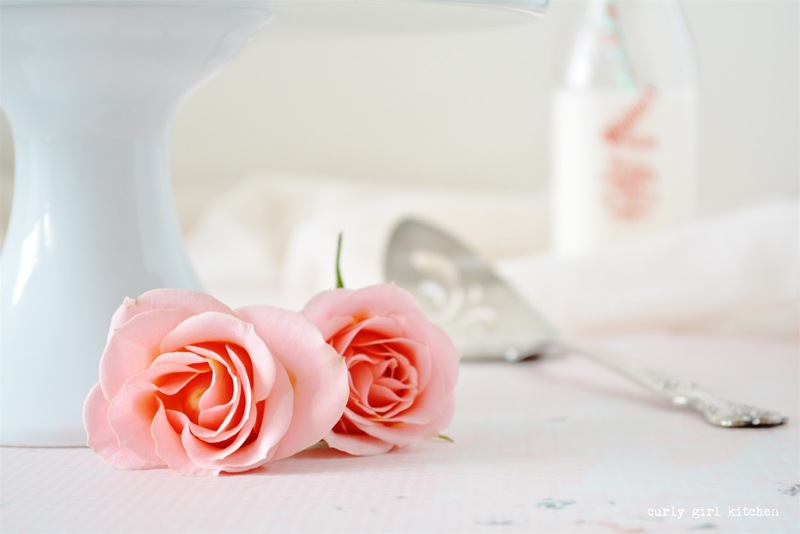 However, this listing here on Etsy looks like the exact same cutter I have, and it makes it so easy to make these little roses. 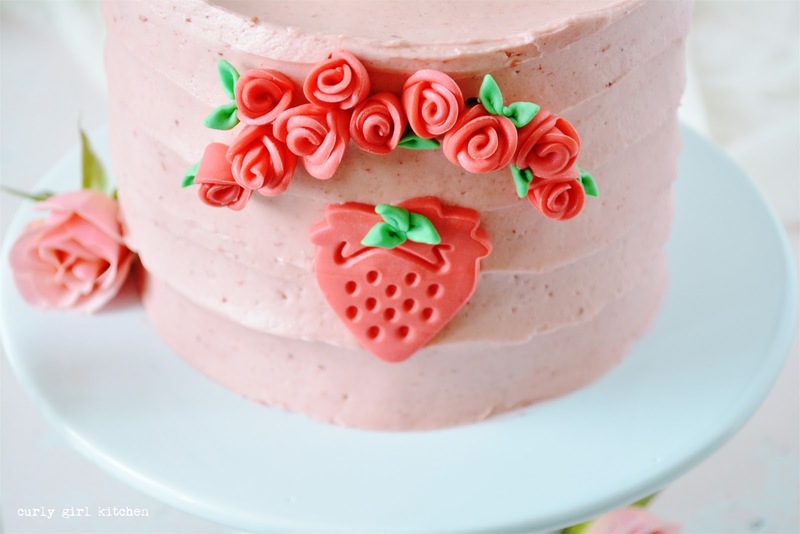 After forming the roses, I inserted a toothpick into each before they dried, and then inserted them onto my cake the next day. 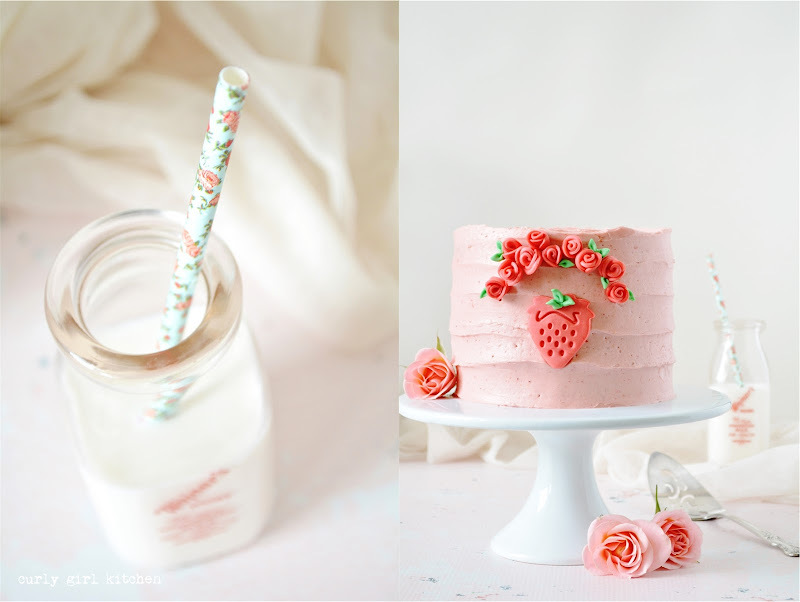 How pretty and sweet is that little arbor of roses over the strawberry? If my strawberry shortcake doll had a birthday, this is the cake I would make for her. 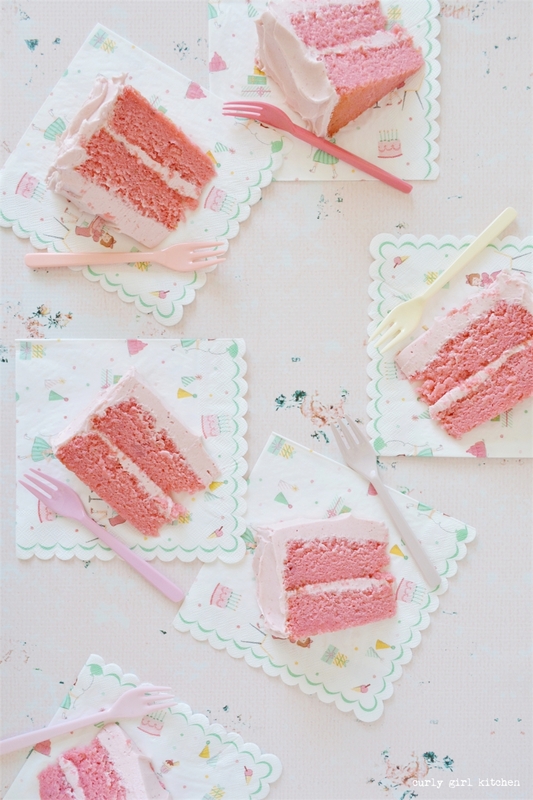 Be sure to read this post and this post for tips, baking FAQs, and high altitude cake baking. Set all of your dairy and cold ingredients out ahead of time so that they are at room temperature. For the strawberry puree, wash and hull about a half pound of strawberries, and puree to liquid in a food processor, adding more berries if needed. 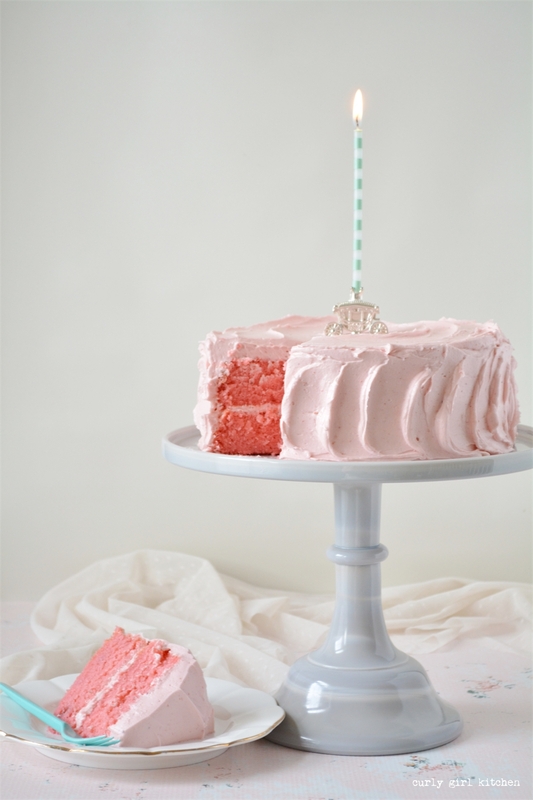 You'll need 1 1/4 liquid cups puree for both the cake and the buttercream. Measure out your flour, using the "spoon and sweep" method, then sift to remove any lumps. Sifted cake flour yields a much lighter crumb. You can also use whole freeze-dried strawberries and crush them to powder with your food processor. Whether whole or already in powder form, the weight is the same. If using powder (available on Amazon), the ingredients should list nothing but strawberries. Other "mixes" such as for protein drinks or strawberry milk, etc, are not suitable replacements. 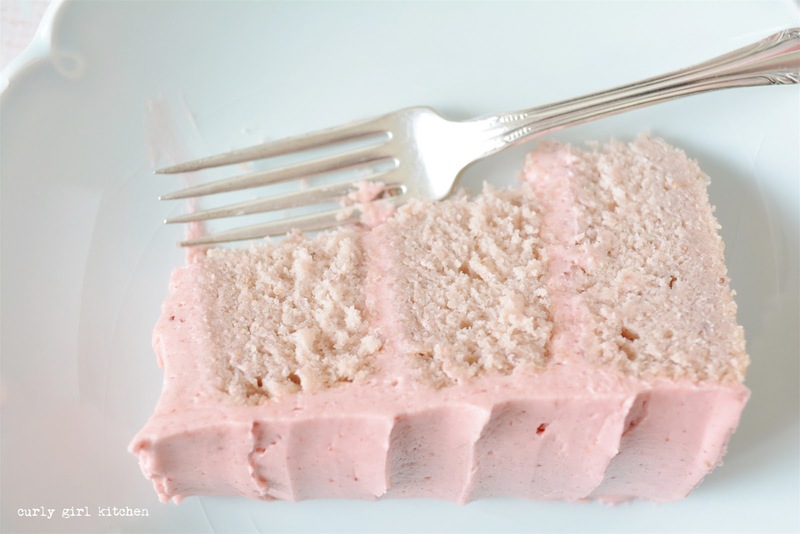 Although your cake batter will start off as a pretty pink, it will fade to the pinkish-tan color you see pictured here; this is simply what happens to strawberries when they bake. 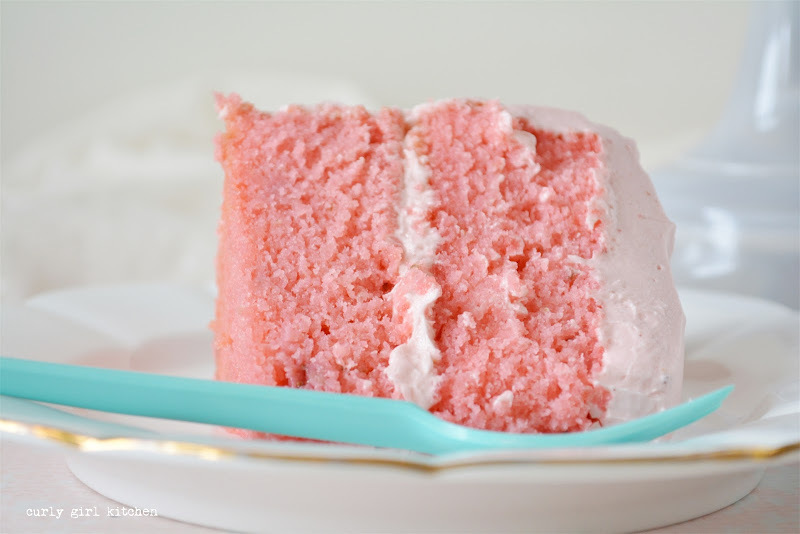 If the color bothers you, tint your batter with a few drops of red food coloring for a more vivid pink cake. 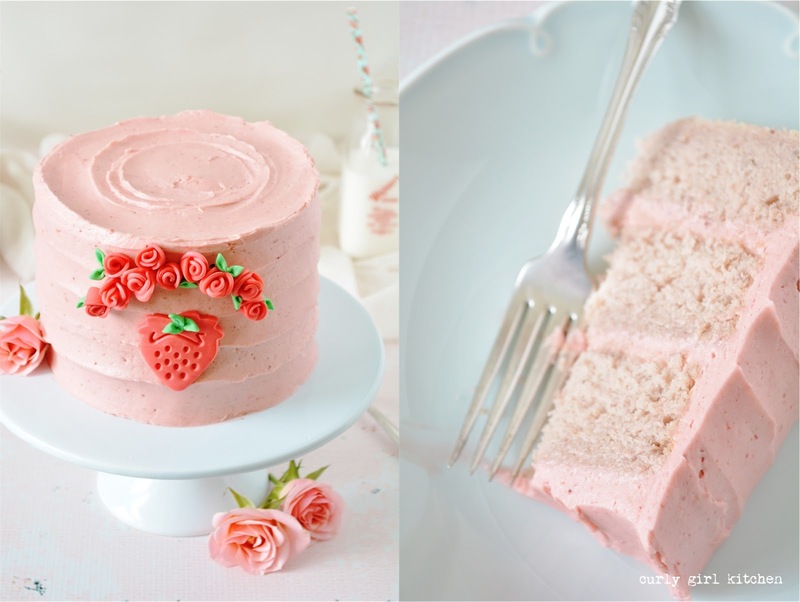 The buttercream remains naturally pink from the strawberry powder and puree. This cake uses egg whites only; don't throw out the yolks! Use them to make lemon curd, a custard-based cream pie or tart, or ice cream. Preheat the oven to 350. Grease three 8-inch cake pans with non-stick spray. Prepare your strawberry puree and set aside. In the bowl of your stand mixer fitted with the paddle attachment, cream the butter and sugar for 10-12 minutes (yes, for that long), scraping the bowl occasionally, until fluffy and lightened in color. Scrape the bowl down and beat in the strawberry puree. Add the egg whites, lemon juice, buttermilk and vanilla and mix to combine. The batter will look lumpy/curdled. 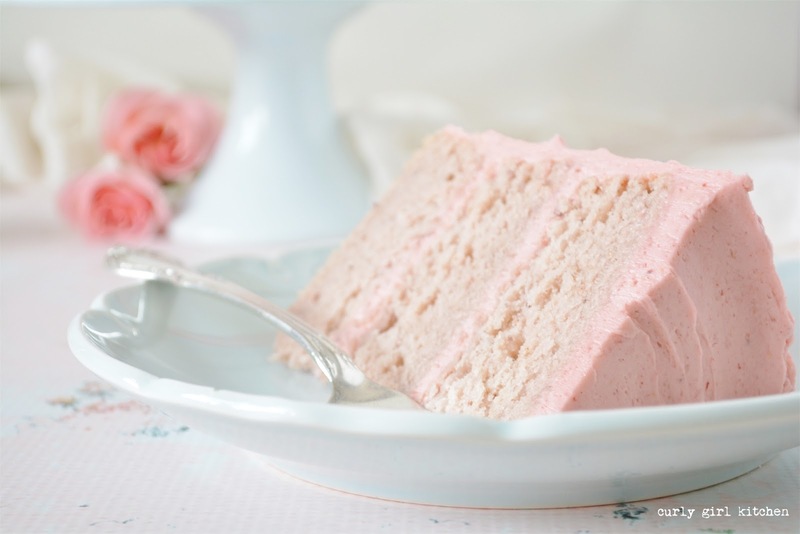 In a separate bowl, sift together the cake flour, baking powder, salt and freeze-dried strawberry powder. Add to the mixing bowl; mix on low to combine, then mix on medium speed for two minutes for a light and airy batter (during this step, also add a few drops of food coloring, if desired). Divide the batter between the pans. Bake for 25-30 minutes, until a cake tester in the center comes out clean and the tops of the cakes spring back when gently touched. Set the pans on a wire rack, cover with a clean kitchen towel, and cool completely before frosting. In the bowl of your stand mixer fitted with the whisk attachment, beat the butter and strawberry puree for one minute to combine. With the mixer on low, add the freeze-dried strawberry powder, powdered sugar, meringue powder, vanilla and salt until combined. Increase speed to medium-high and whip for 4-5 minutes until very light and fluffy, adding the milk as needed for desired consistency. 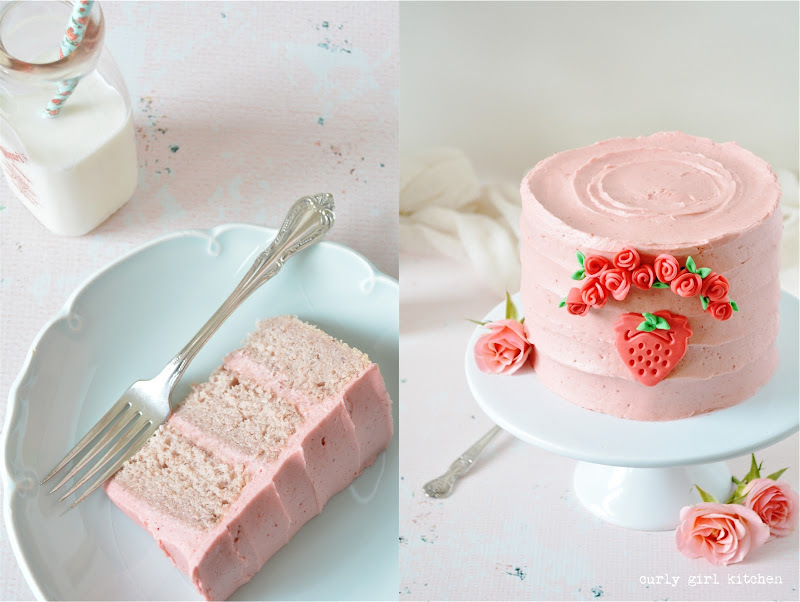 Using strawberry jello or gelatin powder in cake batter to produce an intense flavor and color is a popular option, and most of those recipes start with a white cake mix. I've read so many mixed reviews on this ingredient, and it seems people are equally divided on either loving it or hating it, so I decided to give it a try. 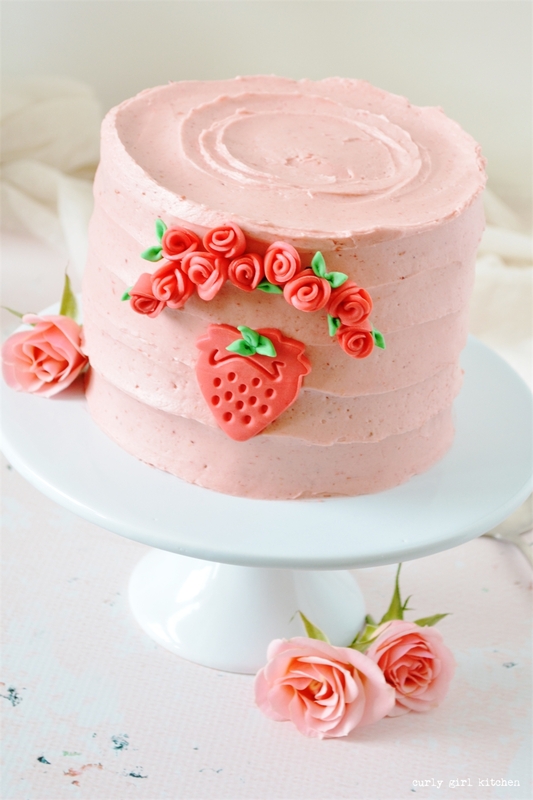 I used my from-scratch recipe above, simply swapping the three ounces of freeze-dried strawberry powder for a three-ounce box of strawberry jello powder, as well as increasing the buttermilk by an additional 1/2 cup to make up for the extra density that I thought the gelatin might contribute to the cake. The resulting cake was, as you see below, a strong pink color from the red food dye. It was incredibly moist, with a sort of heavy crumb that still managed to be fluffy. But the flavor was what I couldn't get past - it was too sweet for my taste, and I didn't at all care for the artificial strawberry flavor of the jello, and I by far preferred the natural strawberry flavor of the freeze-dried strawberries. That said, my personal taste is my own, and I actually think this version is something a lot of people would like. 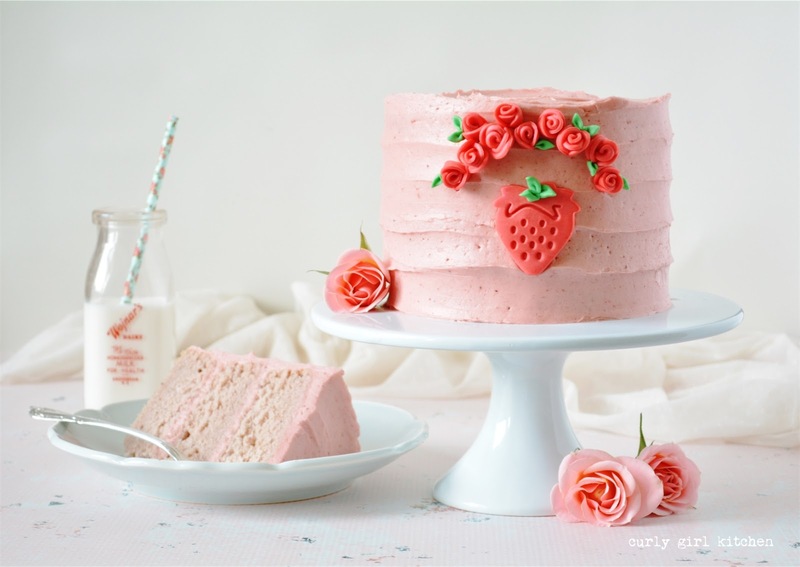 I wouldn't hesitate serving this at a child's birthday party, and I'm certain everyone would love the bright pink color and distinct strawberry flavor. And the leftover cake I sent to work with my husband the next day got a lot of good feedback, so there you have it. Although I won't be making the jello version again myself, I might suggest to others wanting to try it to experiment with reducing the sugar in the cake a bit to compensate for the sweetness of the jello, or perhaps only use 1 1/2-2 ounces, instead of the entire 3-ounce box. I'm also not sure the extra buttermilk was necessary, since it almost seemed overly-moist, if that's possible for a cake to be. I wish I knew what happened to that doll. It's possible it's still in a box of stuff in my parents' attic, but more than likely it's long gone. Cake master - what a compliment!